Category: A New Beginning ! The enthusiasm triggered when Akshat posted in Mumbai Mozilla group chat that, this year, Software Freedom Day is going to be celebrated at September 28, 2014. I didn’t want to leave any stone unturned. Hence, I came up with the proposal of “Introduction to Firefox OS” to present. But, unfortunately, all the sessions were packed and there was hardly any chance to introduce any new. Still, I persuaded Akshat to try his level best. I actually troubled him a lot, nagging continuously with a constant hope. To my excitement, I received a call from Purvesh Shah, who organized the event along with Naman Distro, saying that he can allocate some of his session time to me. My joy knew no bounds and at the same time, was feeling overwhelmed by Purvesh’s courtesy. So, finally, my talk was scheduled from 4.00 to 4.30 pm. But, it’s not Amod’s life, if things happen very straight as desired. A day before, I was diagnosed with extreme cold and conjunctivitis. But, I decided to go ahead with the talk as I dint want to miss any opportunity. I couldn’t make up for the first three talks and I regret till now. I landed at Directiplex at 2.00 pm. I wasn’t sure whether I could gear up for the talk. Surprisingly, when I came across all developers, energy gushed in me and I totally forgot about my illness. Such was the aura of open source community. 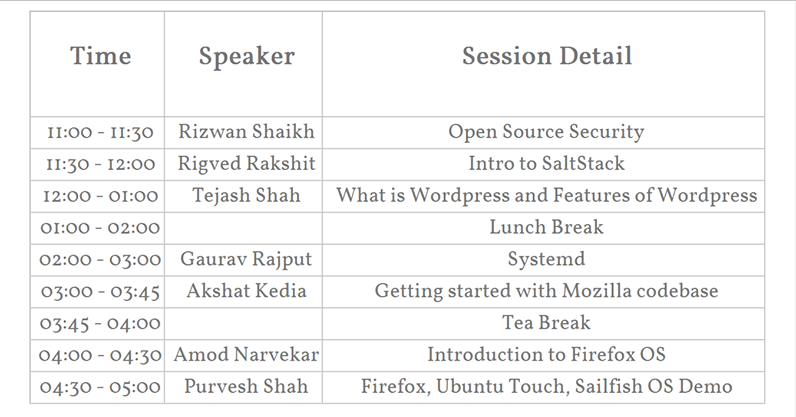 I attended a session on SystemD, held by Gaurav Rajput. He especially came from Hydeabad to give the session. He was the first person I have encountered who detests slides. He used whiteboard and marker to explain his talk. It was very much effective, I noted down few concepts like cgroups with an aim to research at home. Then came Akshat Kedia with Mozilla codebase. I felt it as a narration of my journey through Mozilla as I had started my contribution with bug fixing. He described the seven tools required to get started with codebase and also introduced with bugsahoy and one sample bug. After a tea break was my session. Everything went smoothly. I even showed the video where Christian Heilmann had introduced the features of FxOS phone. I then covered the topics like: why FxOS, steps to make an App, demo with boilerplate. My talk was accompanied with few doubts which were collaboratively resolved. All the presenters were felicitated with a coffee mug. The event was successful even though organized within a very short time. And the credit goes to Purvesh and Naman. Thanks to attendees as well for showing great amount of interest. I made many new friends and their company would help me gaining more knowledge and experience in future.